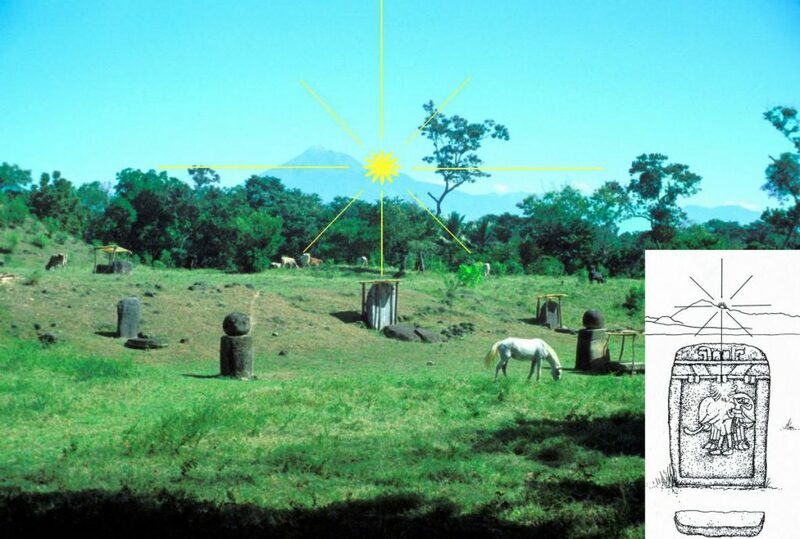 Izapa is the place of origin of the calculation of the solar year (haab); this was made possible by using the volcano Tajumulco for astronomical observation. From Izapa one can see the sun emerging from the volcano on the 21st of June (summer solstice) from which the solar year was calculated in a precise manner using this landmark. 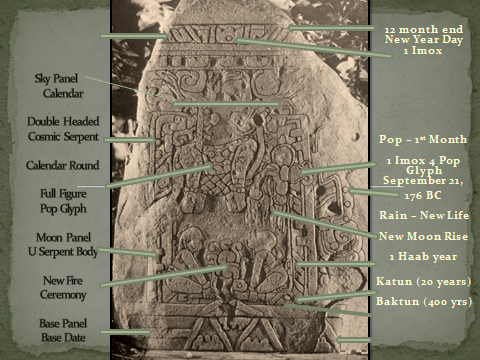 Stela 9 “rebirth-resurrection” monument alignsEast to Tajumulco on June 21 Solstice. Cyclic renewal dedicatory date is 416 years from the Izapa base date of the Sun-Venus-Moon alignment on Sept. 21, 592 BC which celebrates 8 Calendar Rounds and 260 Venus Synodic cycles. 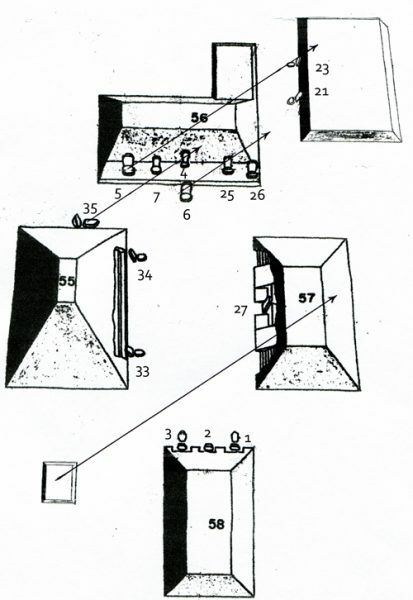 This is the code for the 13th Calendar Round baktun World Ages history on Autumn Equinox 3120 BC to 2080 AD. 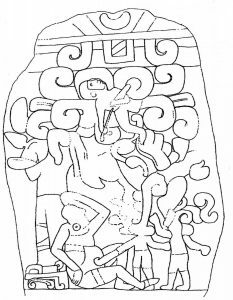 Izapa Stela 10 (9th month position after Stela 12 New Year 1st month) – Child in clouds descends to pregnant mother leaning by a Tree of Life. 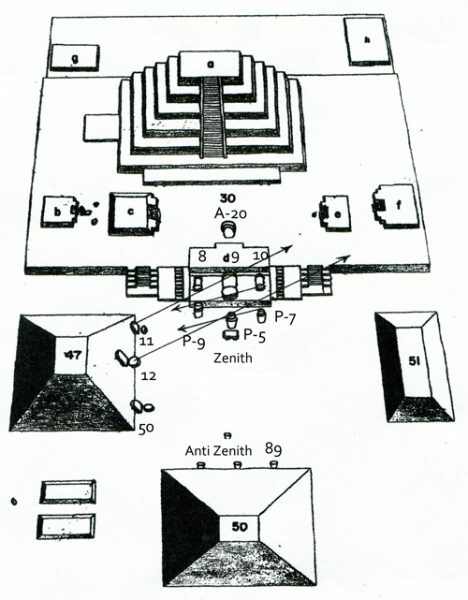 Two main Izapa plazas, A and B, with mounds and carved Stelae oriented to the eastern horizon – sunrise, moonrise, and star constellation rises. LInes in both pictures show zenith sunrise alignment that occurs on both August 13th, and 260 days later, on April 30th.